Not your grandma's Mason jars. Perfect for old-fashioned iced tea, lemonade, or any refreshing drink. Attractive and sturdy with vintage charm galore. Go back to the days of listening to the wireless and drinking moonshine. Set of four glasses, each shaped like a Mason jar, but with an easy-to-hold handle. A future heirloom.Not your grandma's Mason jars. Perfect for old-fashioned iced tea, lemonade, or any refreshing drink. Attractive and sturdy with vintage charm galore. Go back to the days of listening to the wireless and drinking moonshine. 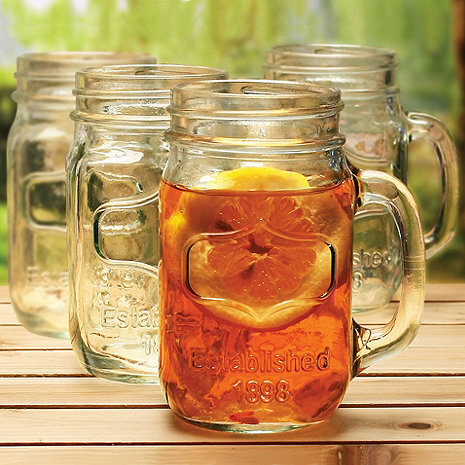 Set of four glasses, each shaped like a Mason jar, but with an easy-to-hold handle. Lead-free. Dishwasher safe. Capacity: 16 oz. Please note lids are not included. Size: 6”H, 2 1/2” Dia. ; Capacity 16 oz. Yes they are lead free. Can I use these in the microwave? BEST ANSWER: Unfortunately these glasses are not intended for the microwave. I want to keep these in the freezer and use for cold beer. Are these thick enough to handle the freezer without cracking? Is the diameter of this glass really only 2 inches? Most mason jars are a little bigger and the regular size lids fit. The specifications say 2 inches. Is this correct? I also wanted to use this for coffee. Will it hold hot liquids? BEST ANSWER: Great question! It is actually 2 1/2" in Diameter, and we have updated our website accordingly. Unfortunately no, it is not really recommended for hot liquids. Thanks again for your question! Do these glasses come with lids? BEST ANSWER: Unfortunately, they do not come with lids. Do these glasses have the mason stamp on the jar? BEST ANSWER: Size: 6”H, 2” Dia. ; Capacity 17.5 oz. Was very unhappy one was broken, as I had purchased lids and straws to go with them! The three remaining ones are adorable, but will have to find one more to make it a set! I really liked these glasses and my kids are delighted. I do not like them to drink anything from plastic so drinking from a jar is fun for my kids. Also I wanted something that would not spill so easily. So far spills have been less! My only complaint and hence 2 stars, is the packaging. I expected 4 but one jar came broken and all I could do was throw it out. I chose not to return the package because the cost for return postage was not worth the effort or the disappointment. I saw others with the same complaint i.e. poor packaging but I chose to take my chances. I would hesitate to order anything in glass from this company. I love my mason cups. But more than anything I LOVE customer services! I gave them to my daughter for her iced tea and cold drinks. She loved them. Love the glasses. My grandparents had them while I was growing up. Unfortunately one came with a chip out of it and it was unusable. I didn't want to send them all back to get the one replaced so I turned it into a catch all for coins etc. Your catalog showed the Mason Jar with tops next to it but they did not come with the tops which make it more unique. Just like the wine glasses come with a Mason top. Brings back memories & now with a handle!